Who doesn’t enjoy eating alfresco, especially in the warmer months. Picnics are a wonderful way to do that. I always felt that I never really fully took advantage of picnic season back home in Canada. I always blamed it on being too short. And when I moved here I thought “Yes! Picnic and patio weather all year round, this is awesome! We’ll definitely be doing the picnic thing, beach thing, patio thing all the time.” Hahahaha! That’s when I realized it had nothing to do with the weather but more with having the time. And sometimes the effort involved in planning a picnic or getting all your stuff together is super exhausting just thinking about it. I had to really change my mindset and try to keep things super simple. I decided to focus on the three things that really make a picnic enjoyable. Food, drinks, and fun or the recreational part of the picnic. 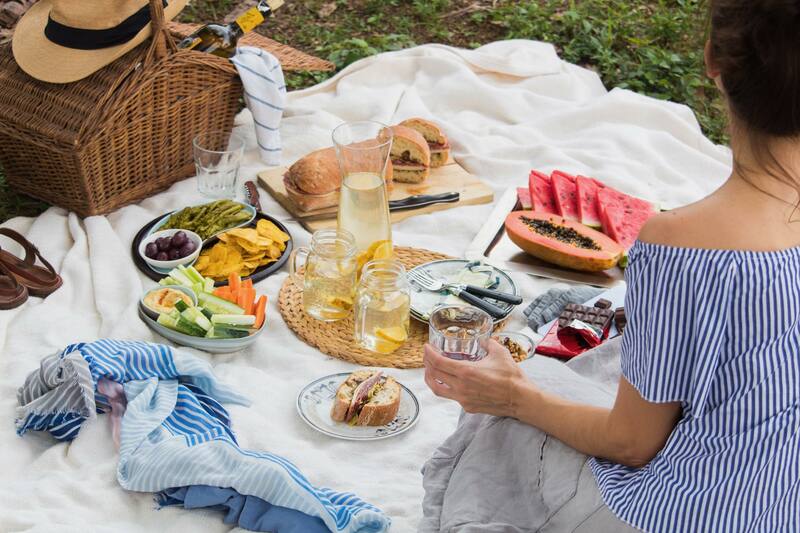 After all, picnics are really just an excuse to enjoy the outdoors and be with friends and family. They are also the perfect way to go out without spending too much. 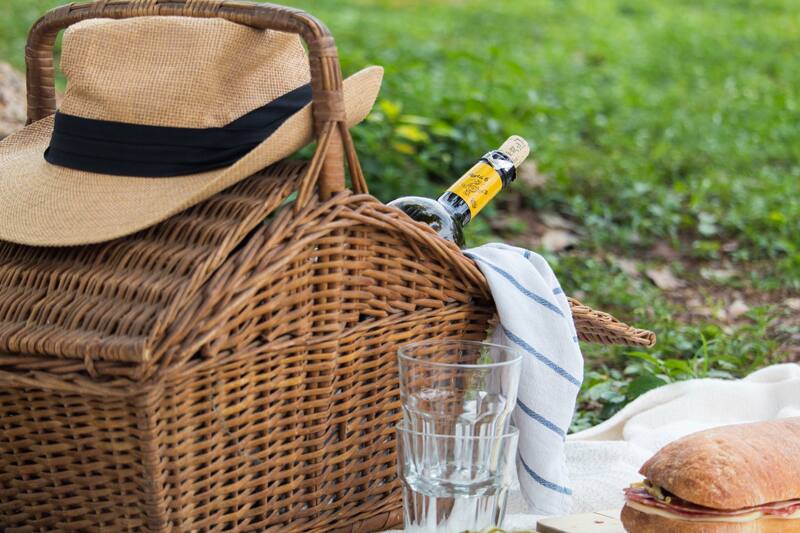 Here are some of my favourite things I like to include in a picnic setting. Let’s tackle the format first. Think about where you are going to set up your picnic. Is it at a park, the beach, someone’s backyard, are there picnic tables and benches? Thinking about it this way will help you figure out what you will need. I love to picnic at a park under a nice shady tree. My knees and mobilty are still ok for now, so I’m totally cool with sitting on the ground but for others you may have to think about bringing some folding chairs or stools for their comfort. I will usually take a blanket, and a few cushions. If you’re inviting more people to join make sure they bring their own cushions, blankets or desired seating. Make sure your blanket and cushions are washable because they will be on the ground after all. I always have a beach bag in the trunk of our car with a lined beach blanket that I love to use too because the liner keeps moisture froms seeping though from any damp grass but I know friends who put down a shower curtain or garbage bags before they put down their blanket. Whatever works for you is fine though. Remember simplicity is key so limiting it to essentials is important. Remember to also bring insect repellent if mosquitos are a concern. How about food? There is one simple rule that I go by when it comes to picnics. It’s my personal rule so I know many may feel different about it but it’s what I go by. I usually don’t bring hot-cooked food or foods with mayo in them, like potato salads, tuna or egg salad. For the reason that the longer those foods sit out in the open the greater the potential of increased bacteria and then getting ill from them especially since the temps here are so high. So what’s left to eat? Plenty! I always include fruits because almost everybody likes fruit. 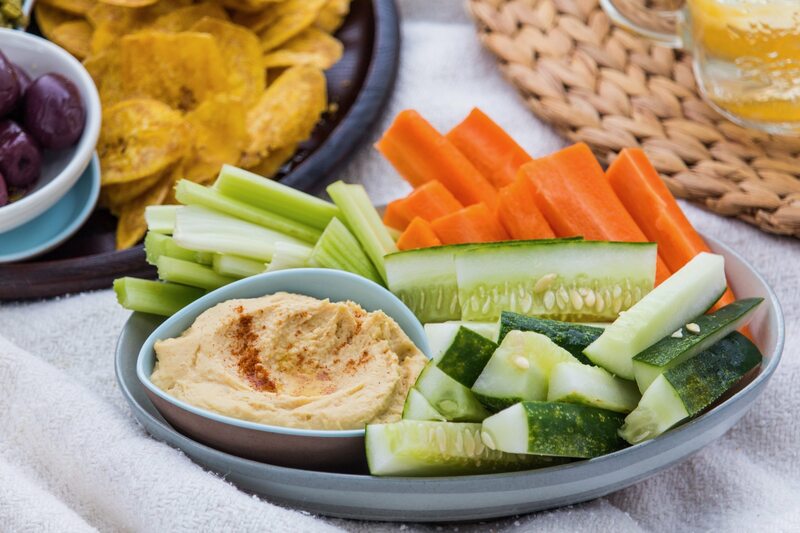 I also love to bring chopped up veggies with hummus or white bean dip. Dips that don’t need cold storage. I also include a crunchy snack. My favourite are plantain chips and nuts, but it could be crackers, crisps, pretzels — you name it. I also like tortilla chips with salsa. 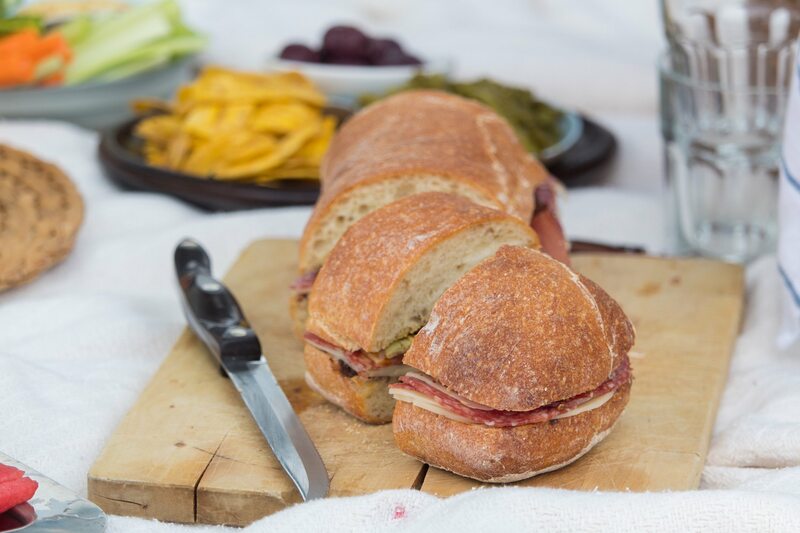 Cut up cheeses and some cold cuts or cured meat are great too with a baguette and some olives or some pickled veggies. I also like to bring some kind of sweets or desserts like cookies or chocolate or chocolate covered nuts which are great finger foods. 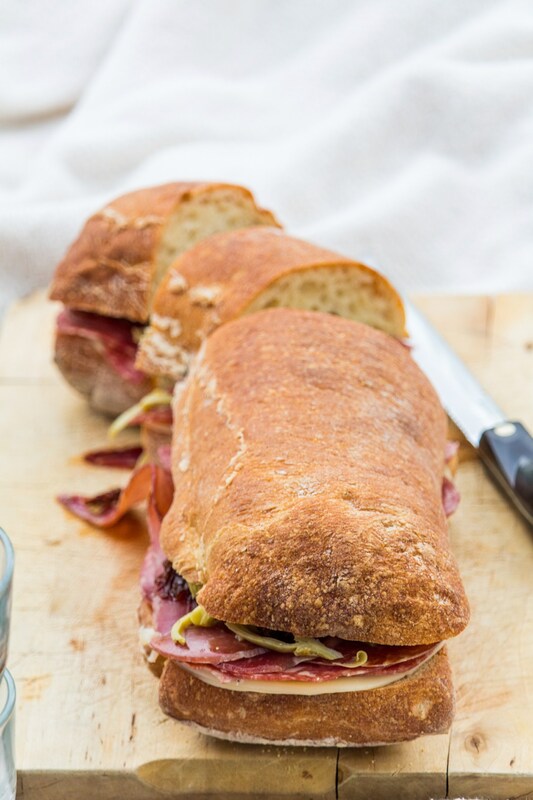 I love to make a big sandwich out of ciabatta to slice and share it around. This one has prosciutto and genoa salami in it with provolone, sun-dried tomatoes, marinated artichokes, a thin layer of olive paste and a bit of mustard. It’s easy to transport and cut and everyone gets a piece. I store everything in sealed containers which makes carrying leftovers a breeze and minimal garbage. 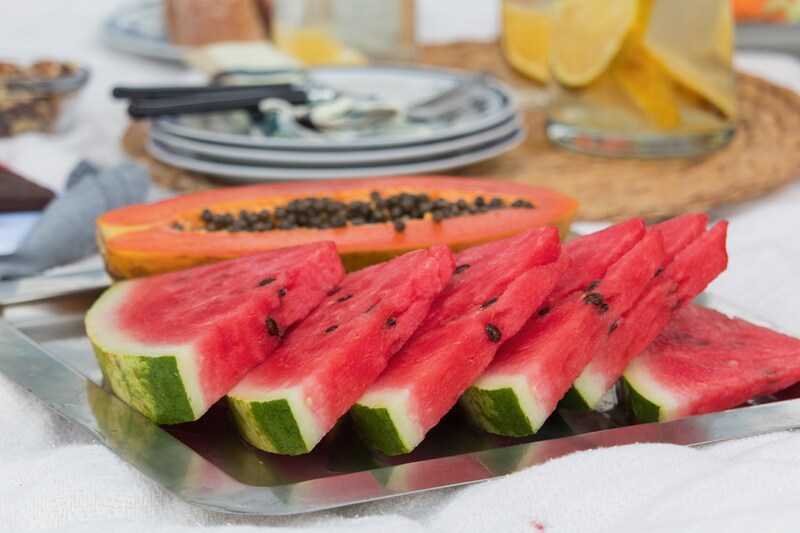 I bring a small cutting board and knife and the cutting board can easily double as a serving tray or a place to set your drinks. All these food ideas require very little if any utensils. They are foods you can eat with your hands and these kinds of foods are a great option because you don’t have to worry about bringing plates and utensils. Napkins are good enough. Bugs and flies are always an issue so the lids on your containers are great for that. I also bring a couple of dish towels or cheese cloths that can be used for spills and even as coverings to protect food from insects. For drinks I like to keep things simple as well. I usually have an alcoholic option and a non-alcoholic option. 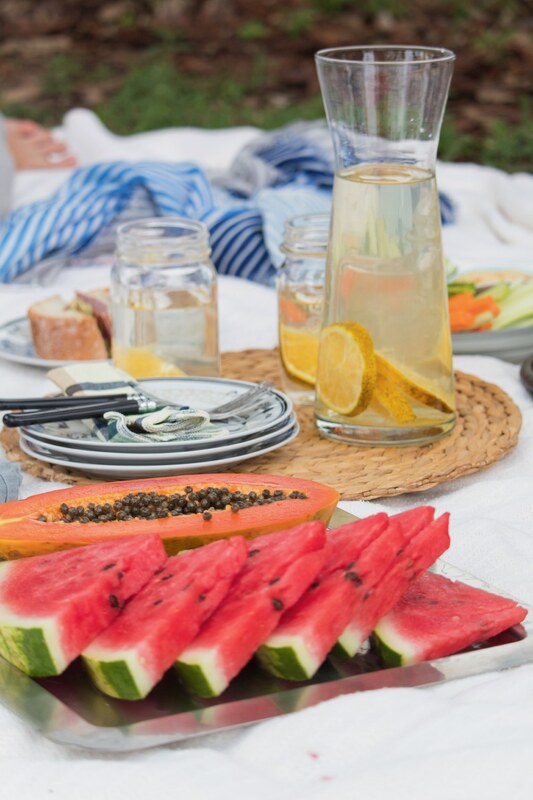 Water is a great way of keeping things simple and it’s easily made a little fancier by just adding some sliced fruit into it. I love wine because well everything, but it’s also easy to transport. I usually chill a bottle of red in advance and then it’s a good temp by the time you open it. All this alcoholic talk only applies if the law actually allows for public consumption of alcohol where you live. Here it is legal but thats not the case everywhere, so definitely check on that. Juice is a great option as well as non alcoholic wines. I like bringing mason jars because they have lids to keep away the insects but disposable cups are lighter to carry. What to do to have fun at a picnic? For me the picnic experience itself is enough. I dont really need more entertaining than the food and good company along with the outdoor setting. But for those who need a little more stimulation a deck of cards or a board game might be fun. For those who need to be a little more active there’s always frisby or catching a ball or a friendly football game. 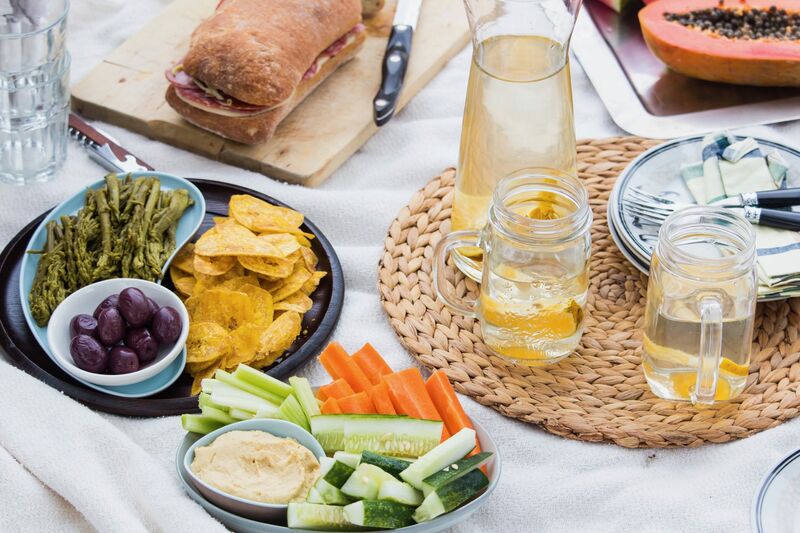 Just a few simple ways to incorporate some activity into a picnic. Im usually the lazy one laying back on the blanket watching the clouds and chatting. So thats how I like to picnic. 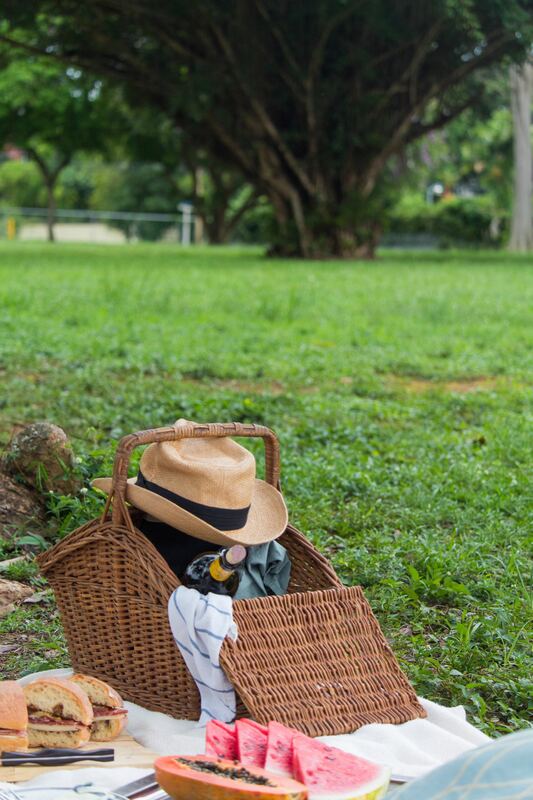 You don’t need a basket to picnic either. I usually have a reusable grocery tote that I carry most of my things and a medium sized cooler bag. I do have some picnic accessories that I have collected over the years but they aren’t essential for a picnic. The key to a good picnic is really pleasant weather, a nice spot even if it’s in the backyard and the people you are with. That’s what really counts. We have even gotten together outdoors with a box of pizza and some soda and that was perfect! So don’t over complicate things, just get out there and enjoy being outdoors and connecting with people face to face. The food and drinks are just bonuses that make the time spent more enjoyable. 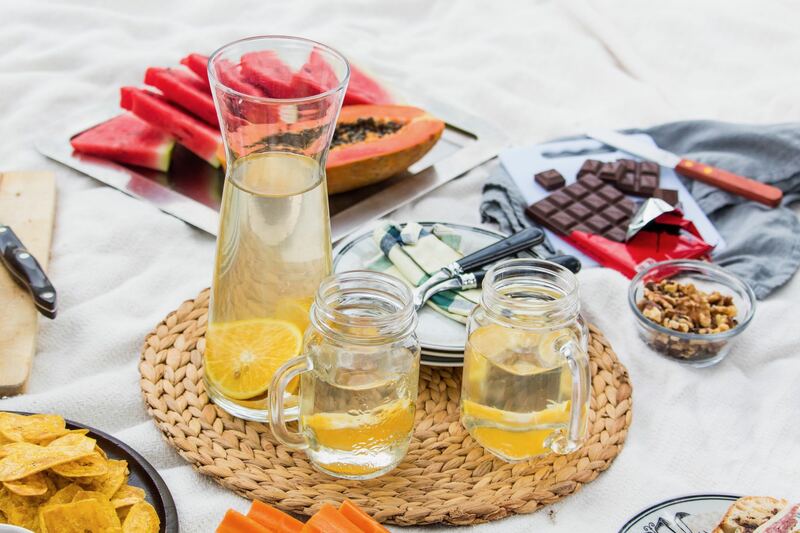 I loved sharing my picnic essentials but would love to hear about yours! 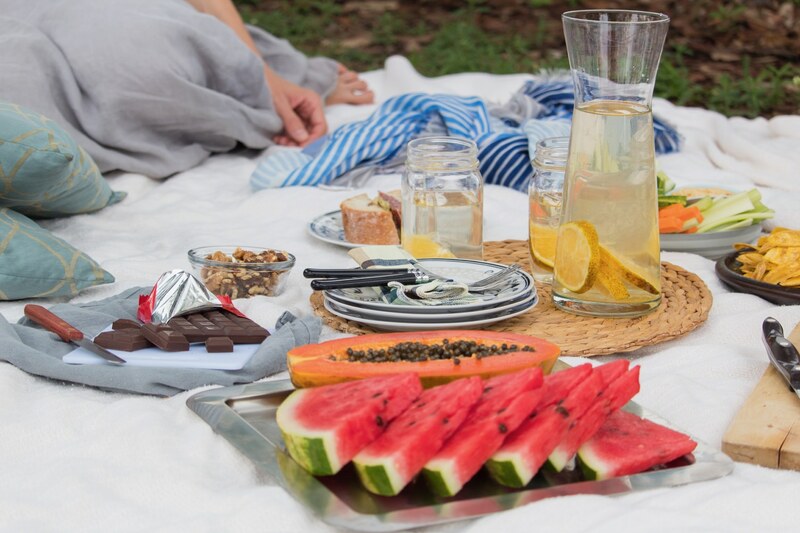 What are your picnic must haves?